There’s a new pedestrian and bicycling path on Kauai’s east shore—Ke Ala Hele Makalae. Over four miles long, it hugs the dramatic coastline while following old sugar cane-haul rail and truck roads. 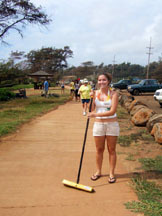 On the second Saturday of each month, Kauaʻi Path volunteers help maintain the beauty and safety of the island’s paths and you can join them. Second Saturday Sweeps start at 8:30 a.m. (meet at the Kapaʻa Neighborhood Center) and end at 11 a.m. with a potluck lunch. The next Sweep is March 13. For more information, visit www.kauaipath.org, or contact Thomas Noyes, ThomasNoyes@hawaiiantel.net, (808) 639-1018. A volunteer on Second Saturday Sweeps day. 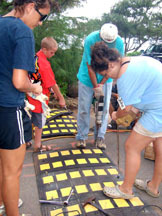 Installing speed humps for path safety.